I have learned most of what I know in photography by observing others that are better at some aspect of it than I am. 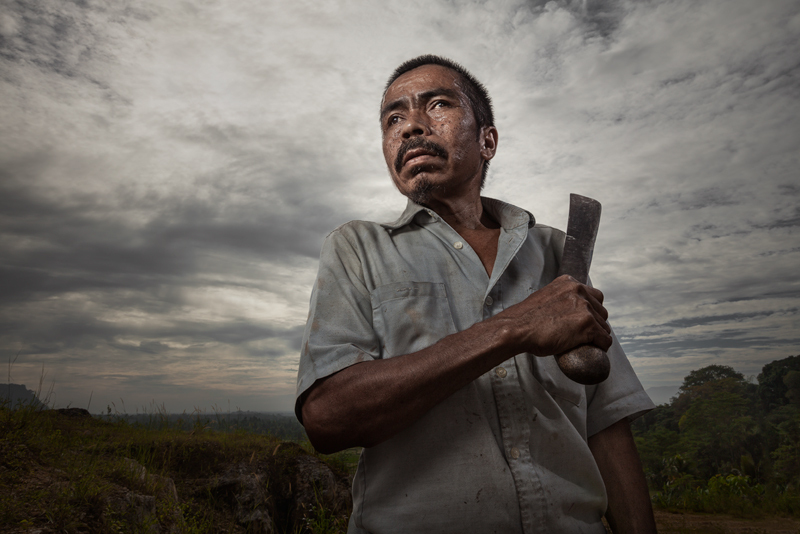 I recently learned some great portrait techniques from Indonesian photographer Rarindra Prakarsa, who shoots beautiful and compelling environmental portraits. I really enjoyed shooting these pictures and was happy with the results. First, the subject and background must both be compelling. Notice in the shot below how excellent the subject is and how well the background complements him. This was a very friendly guy who works in a shipyard in Jakarta, Indonesia and who just happens to really know how to pose. You have to be really talented to get a bad picture of this guy… I had a number of keepers and it was difficult deciding on my favorite. 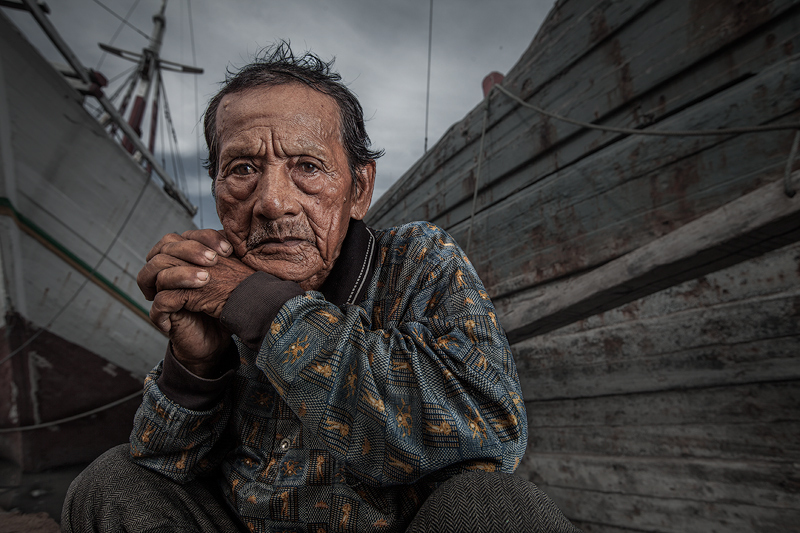 What makes this image is his great expression and the interesting background which complements him so well. 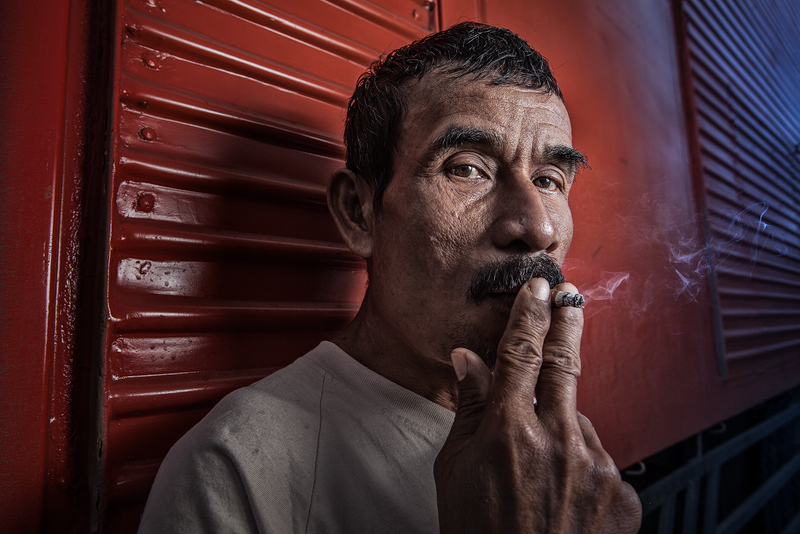 Dock worker in a Jakarta shipyard poses for the camera. Second, use a wide-angle lens and shoot from below eye level. Wide-angle lenses aren’t normally thought of as portrait lenses and don’t work for everyone. But, for certain subjects, shooting in the 20mm-30mm range can really work well. Shooting from below eye level makes your subject look larger than life. In the image below, I shot from significantly below eye-level and the result was…. well, very cool. Third, carefully position the hands to be part of the composition. When a wide-angle lens is used, hands in the foreground will look much bigger than normal (as in the picture below). However, this looks good in these images in my opinion. Fourth, use a mix of natural light and flash. These pictures were generally shot using just one off-camera flash at a 45-degree angle to the subject. Don’t overpower your subject with flash. You want to make it look like no flash was used. You’ll want to set your camera to “manual”, expose for the background (I generally underexposed a bit for these shots) and then bring in the flash. Fifth, shoot either early or late in the day (when the sun is low in the sky) or in overcast conditions. Bright sunlight on your subject will generally ruin the picture… especially if he or she is squinting from the sun. What I like about these images is that the wide-angle lens creates a perspective that doesn’t look quite “real”. Because of that, these techniques are entirely inappropriate for many or even most portraits. You will want to use different techniques if you are shooting a wedding or senior portrait, for example. Posted in Tips and Tricks on April 26, 2014 by Ken Koskela.